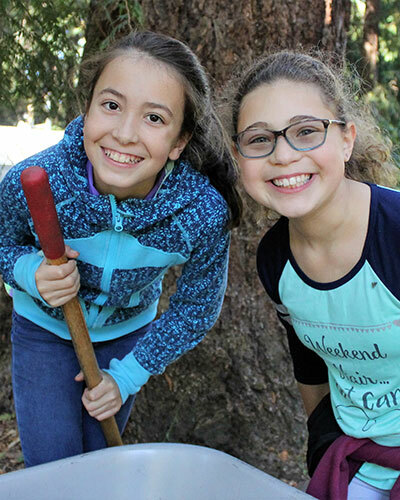 The Overlake School’s mission to inspire excellence, develop curiosity, teach responsibility, embrace diversity and foster a compassionate community is carried out through service learning. Through real world experiences, students are introduced to the complex needs of their community, invited to collaborate and problem-solve with non-profit organizations, and encouraged to engage in lifelong service by pursuing an area of interest. Students employ knowledge, skills, talents and interests to engage civically and think critically resulting in positive change for themselves and the communities they serve. Through well-planned experience and personal reflection, students gain an understanding of their role as responsible, caring citizens. Moreover, research indicates that students engaged in service during high school are more likely to remain civically-engaged adults. Youth involvement in Service Learning programs leads to higher rates of voting, volunteerism and improved academic success (Corporation for National and Community Service, 2008). Overlake students participate in school-wide service days. Middle School participates twice per year (Fall/Spring) while Upper School participates in the spring only. Students are grouped by advisory in activities rooted in grade-level themes. Advisors act as facilitators structuring the learning experience before, during and after their outings to support student learning and reinforce a meaningful reflection process. The thematic structure is designed to create meaningful experiences that are varied, connected to curriculum, and supportive of actual needs expressed by non-profits in the community. Students may choose to engage in service via an array of clubs focused on impact and change. At the Middle School level, the ASB leaders may opt for a Service sub-committee to lead students in various fundraisers or awareness campaigns. In Upper School, club options expand and specialize. Outreach Club, Philanthropy Board, KIVA, and Free the Children, are all opportunities for students to engage in a service area of interest. Students select from many experiential learning options during our spring Project Week. Among the offerings are local, domestic, and international service-based experiences. Past projects have included serving Seattle metropolitan area non-profits, New Orleans hurricane relief, Habitat for Humanity projects, and teaching in local Redmond schools or internationally in Cambodia and Uruguay. Project leaders instill goals and expectations during the months leading up to Project Week to prepare students and promote an enriching experience for them and participating communities. Students complete journals, assignments, and/or self-evaluations to capture and reflect upon their learning outcomes. Service-based opportunities exist in select disciplines (Social Science, Science, Life Skills and Art) through delivery of curriculum by classroom teachers. Whether engaging in political action through letter-writing, exploring social justice by meeting with government or non-profit leaders, producing art to raise awareness for a cause or exploring environmental science, students learn about complex issues and take action to better their world. The Overlake School maintains a special partnership with Hopelink: Avondale Park; a transitional housing facility located a half-mile from campus. Avondale Park provides shelter for families as they move from homelessness to long-term stability. Overlake faculty, administrators, students and staff serve a hot meal to Avondale Park residents monthly, while students sponsor families for holiday gifts for families through our Holiday Helpers program led by the Outreach Club. In addition, the Overlake Kitchen demonstrates commitment to the community through sustainable practices by donating surplus perishable food to local community food banks.